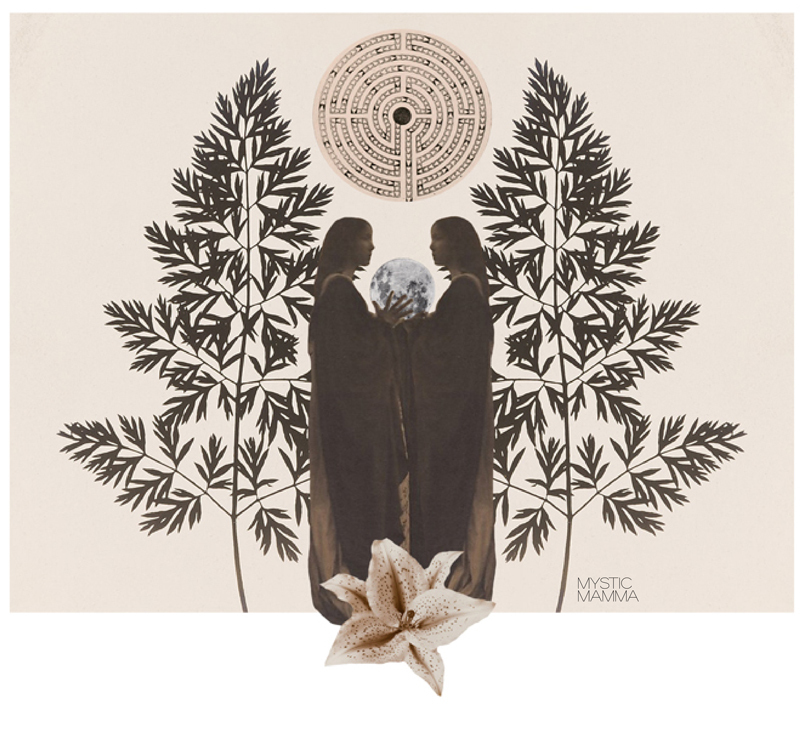 *FULL MOON* rising in Gemini on November 22nd 2018. Venus went direct on November 16th and on that same day Mercury went Retrograde. As our hearts return from their underworld voyage our focus turns inward to nourish ourselves as we process so many of the changes that have been occurring. For most of us these have been some very turbulent times. For me and our community in the mountains of Southern California, we have been dealing with the blazing wildfires where so many lost their homes and their loved ones. My family and I had to evacuate from our home for over a week but gratefully our home and community were spared. There is no doubt that experiences like this bring to the forefront what is most essential and what truly matters most. A reminder to never loose sight of that. We, each in our own ways, have been moving through trying times. This Scorpio cycle has been teaching us of the power of regeneration, and our ability to go through the fire and literally rise from the ashes like the phoenix transformed. With this Gemini Full Moon, we have the opportunity to see things from multiple perspectives and gleam ideas of what could be possible. We must dream the new. “As we emerge out of Scorpio’s deep well of emotional memories, we can release them to burn up in the Phoenix’s flames. “As Scorpio’s emotionally instinctive Snake transforms into the Eagle’s insight, there is a sudden burst of awareness as the Phoenix rises from the ashes of these transformations. “The fire sign Sagittarius follows the watery sign of Scorpio. Out of the dark depths comes enlightenment. We’ll especially feel this change now that Jupiter has left Scorpio and entered Sagittarius. “This Full Moon brings together the Sun and Jupiter in Sagittarius…Jupiter/Sun in Sagittarius can get self-righteous if he doesn’t watch out, but otherwise, he can be an inspiration to others. “The Gemini Moon just laps it all up, reflecting back both the good and bad ideas floating around without judgment. “Mars in Pisces wants us to be spiritual warriors and challenges us to look at things with an encompassing and compassionate vision that includes what is normally left out of the discussions — those rejected, needful things we’ve pushed into the collective unconscious. Like homelessness, poverty, war. Like a woman’s worth and a child’s needs or the care of our elders. It urges us to listen to our Native people and Mother Earth. It asks us to be kind to ourselves and hopeful for others. “Mercury is the planet said to ‘rule’ this Gemini Full Moon…So be conscious of what you say, mean what you say, and say it with kindness and intelligence. “Neptune can make your mind fuzzy or it can fill it with true images, which you need to interpret correctly. “This cycle comes into fullness with the energy of an inspired new beginning. With Gemini/Sag we are able to consider not only information, detail and all mental input, but we are also able to hold the big picture vision we all need as we pass through this time of tremendous transformation. “Mercury in Sag… and riding under the influence of the Sun/Jupiter conjunction, it’s important to be mindful of what you say, how you say it, and the effect on others. “When you are on the receiving end of a stronger than necessary communication, you may need to step aside and let your breath (Gemini) guide you into a balanced response, otherwise that Mars square to the Sun and Moon may take you somewhere you DON’T want to go. “The Moon is aligned with the fixed star Alcyone at the time of the lunation, infusing our Full Moon experience with that star’s influence. “Alcyone is the main star of the Pleiades star cluster, one of the Seven Weeping Sisters. ‘The central theme of Alcyone is that of handling and overcoming burdensome problems…Probably the greatest challenge is learning how to handle strong emotions. “With recent events, it isn’t hard to imagine how this influence might play out. So many of us are either in the process of handling life-changing circumstances or are profoundly affected by the stories and situations we hear about, concerning either loved ones or even strangers. “Taking these various influences into account, we shouldn’t be surprised if we feel particularly ungrounded and a bit moody this week. May these weavings of wisdom serve us well, as we remember we are not alone on this journey. FULL MOON love + blessings! Thank you so much, Mysticmamma, even after being evacuated for more than a week, you found the time to put this together and gift it to us. I know how confusing an experience like the fires is, I was evacuated for almost a month last year during the Thomas Fire, and it took me several weeks to go back to my work and focus properly. A purification indeed! Sending love to you with the upheaveal. May we all ride these waves with grace. I’m in the process of separating from my husband of 20 years. This has been one of the hardest times of my life. When I told my father this morning, I was met with blame and persecution. It’s been a devastating time. This helps me make sense of it all and I’m happy to see a shift in the cosmos. I feel it and am indeed ready to embrace the next phase and rise from the ashes. Happy Thanksgiving all! I hear you sista. I’ve been 44 years just waiting as if I haven’t already invested enough energy and time, but it appears that Now the Universe is aiding us to move forward. All the best to you. . Thank you so much for sharing your knowledge and insights with us. It’s priceless. To me, it’s an invitation to take a distance from our own lives and continue to evolve. Thank you for continued efforts, Mystic Mamma. They are making a difference! What a journey so far….just got word after an indepth 2nd interview (& months of trying to find the right fit) of a job I REALLY wanted & needed… I didn’t get it. Ugh, feeling so sad & at a dead end. I know something good is around the corner & yet this is hard to shake. Hi Amy,challenging times in so many ways as MM & the wonderful Astrologers explain. Blessings to you & your situation – I wouldn’t normally mention any other healing systems here but feel a strong urge to ask if you’ve heard of Jarrad Hewett as the work he does with many via online community/ energy-shifting audios to listen to etc can clear fears & contradictions in your energy field that may be blocking you or causing conflicting directions hence your efforts not creating clear results. He’s defo genuine gifted guy & fun too. Mitaqueouyasin. You’re the best. Thanks sista. Grateful as always for the amazing insights x Sending love and strength to our soul family in California, especially all those affected by the fires. Thank you Pam 🙏🏾 Yes echoing the love and prayers for all in California who have been directly affected. I suffered the loss of my beautiful sister 3 months ago, I have days where I can push aside the loss, stay busy and hide from it. Then there are the days when it creeps upon me and a wave of sadness and grief almost knocks me over, whenever we are in a full moon phase I feel it that much heavier. I am trying to release as much of the pain as I can, not only with this most heartfelt loss I have ever experienced, but trying to release old fears and hurts that are still holding me back. I want to soar with the eagles. Light and Love to all. So sorry for your loss Sharon. Thank you for sharing your experience. She is still with you always. ∞💗∞ Much love to you! Thank you so much for continuing to hold space for these beautiful messages during your extremely challenging time. I always appreciate the insights that are shared. My blessings are with you and your loved ones. Invisioning the highest good for all. Thank you so appreciate all your wisdom! I look forward to your insightful words of wisdom every month, thank you so very much for sharing with us. As I take in these insights they stir my hear/soul and touch my emotional being, to the point where I go inside to self examine/reflect. Your insights have helped to shape my thinking, tremendously. I thank the universe for using you as an instrument of light and love. Deepest Gratitude for this beautiful resource of reflection, wisdom & community💕 Its contribution ripples forth during this transformative period. Blessings, courage and strength to all on the path. Wonderful, as always. Thank you Mystic Mamma and gifted astrologers for your sage insights. Thank you for sharing, MM. I’m so grateful your home is safe. A friend lost her home in the Camp Fire. Many people have offered to help but very few have actively done so. Thank you for this possible explanation, Pam Younghans: “Even those souls who appear strong may be feeling very fragile or vulnerable beneath the personality veneer.” My friend puts up a very strong front. It is difficult to give to strong people. Friends don’t know that when this strong-looking person is helped she completely melts inside with relief. She said the simple act of people reaching out with hand written letters would mean so much. This is something I will remember going forward. I’m so sorry to hear about that your friend lost her home in the Camp Fire. My heart goes out to her and so many that have been affected. You bring up such a good point about reaching out even if the person appears strong. There’s nothing that touches us more and restores hope in our hearts that kindness shown. Thank you for gifting us these words of insight, wisdom and love in such difficult times that you and your family have experienced. You are an inspiration in these times, as you resemble the Pheonix rising from the embers. We all rise together – Thank you. Sending love and appreciation for your work, also best wishes! Tonight I have realized how allergic I am to my daughter’s guinea pigs and this is very dire, although it may seem silly. She’s out of town at the moment and I don’t know how to tell her what I really know now. I am tired of trying to find ways to manage but I’m suffering with asthma, and it’s so hard to be myself, 100%. But the guinea pigs are such a lifeline, such a healing factor for my daughter! She’s battling depression and anxiety; her piggies being her so much relief. My health is at stake if piggies continue to live here. I’ve got more non allergy strategies to try but ultimately I want them completely gone. Telling her this will devastae her and I don’t have a solid plan of where to move them. I feel sorrow for this realization I’ve had, this is a delicate matter. My daughter is 12, and she can’t move out. My allergies prevent my from allowing cats as pets, and now guinea pigs. As a mother, this is a difficult position for my kids to understand. They see me as fine, and string but beneath that front I’m vulnerable as I have been hurting, and tired of taking allergy meds and inhaler to function!!! thank you so much for sharing this beauty. after 30 years on this planet this jupiter in scorpio and venus retrograde has brought me to new depths of shadow around the repression of my sexuality/queerness. it’s gifted me with a deeper sense of sorrow and pain that I’ve yet to encounter in my body, which i am learning to thank as a sign that i am more deeply embodying. The flow of tears for me right now is SO real as this report reflects back to me! as Clarissa Pinkola Estes says (paraphrased), people are afraid of women’s tears–they loosen the nuts and bolts of what they’re used to. i see the light of the sagittarius optimism guiding us out of the darkness, and am so thankful for these wise words to usher us into wider visions of ourselves amidst the beauty & chaos. thank you MM. Thank you once again for such powerful words and insight. My thoughts are with you and your community. Sending much love and light. This Sunday will mark two years since our sons passing. The mix of energies (mercury, moon and personal) have been sending me on an emotional roller-coster. Being aware of these intense energies, I’m learning to be gentle on myself and my needs. I’ve learned when to say no in order to self-preserve. This time of year can trigger many emotions for those who’ve lost something or someone (Thanksgiving, Christmas, etc…) not everyone has family. Not everyone has a home. We really need to a little more aware and compassionate. We need to love a little bit more and just be a good human. These words resinate with me so much at this time. Thank you so much for the Full Moon in Gemini update, despite challenging personal circumstances. “Bereavement, loss, and sorrow ” it is, as I spend as much quality time as possible, with Stewart, who has a Grade 4 inoperable brain tumour. The shock has been enormous ~~for him especially. He is an 11/11 Scorpio ~ and true to his sign, deep as the ocean. I love him so much, and please send good vibes this way. very powerful! amazingly accurate!! so much gratitude for Mystic Mama!!! Thank you! Beautiful. Glad you and yiur family are okay. Love this! So much gratitude for this site and blessing to all that were and still may be effected by the fires. 💛💛💛💛 sent to Jean and Stewart. So glad to know you are safe. So moved by all comments. A. walker…..please consider your value re your daughters’ pets and your allergies…. 12 is old enough for a child to wise up to your health needs. Your opportunity and hers’ as well will provide a deep, rich, intimacy building passage for you both ….as you step into your value with honor and take the initiative to count…..you know like putting on your air mask in a plane before you put one on a passenger …making that a rule of thumb is my prayer for you….this is a layered growth opp to mine for self love….